Microsoft is changing the name of its Cloud storage service ‘SkyDrive’ as ‘OneDrive’ after a legal dispute with UK-based Sky Broadcasting. SkyDrive cloud file storage service is launched in 2007 by Microsoft and very soon all the products of SkyDrive will drift to OneDrive.com. SkyDrive is free online storage for files that you can access from anywhere. You can easily access your office document with SkyDrive and can share your docs with friends and work on them together. 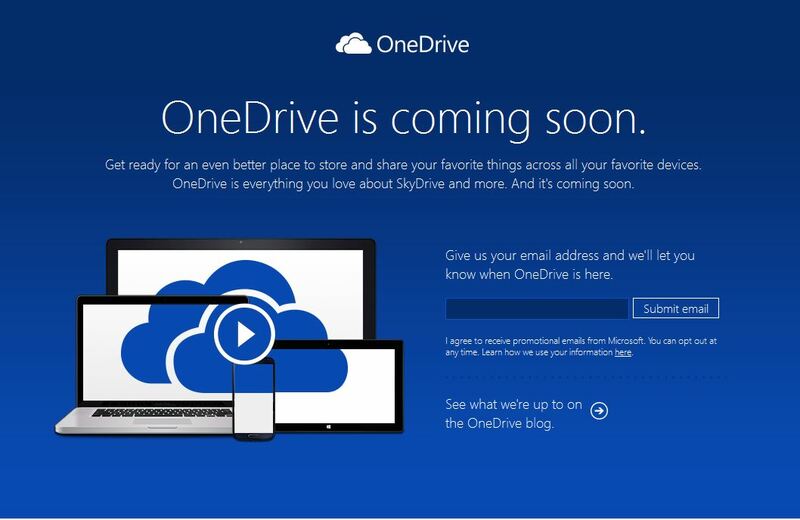 Now why to call SkyDrive as OneDrive? Microsoft’s explains this in its site. It describes the OneDrive service in blog as, “one place for all your photos and videos. One place for all of your documents. One place that is seamlessly connected across all the devices you use”. Currently the website OneDrive.com shows a preview site, where it ask its users to just give their e-mail address and Microsoft will let them know when the OneDrive service will be open for its users. Also functionality wise, OneDrive will work same as SkyDrive. Users will not notice any change in OneDrive service. Let’s have a look on the promotional video added by Microsoft on YouTube advertising the name of SkyDrive as OneDrive.